When it was launched four decades ago, Roundup was hailed as a miracle product, a revolutionary herbicide that would transform farming and keep home gardeners happy too. And it came with the promise that it was safe. Now a landmark US court case has made headlines worldwide, with a jury declaring Roundup was a substantial factor in causing a school ground keeper's terminal cancer and that the company had failed to warn of the risk posed by the product. The case has lifted the lid on the lengths the company has gone to, over decades, to avoid scrutiny and to silence their critics. "I would like to see them admit that they realised it was not safe." Former farmer and litigant. In interviews with key players in this corporate saga, reporter Stephanie March found a scientific community polarised while the company continues to staunchly defend its actions and its product. Four Corners traces the company's influence campaign from the US all the way back to Australia, where Roundup is used on farms and in household gardens across the country. The Monsanto Papers, reported by Stephanie March and presented by Sarah Ferguson, goes to air on Monday 8th October at 8.30pm. It is replayed on Tuesday 9th October at 1.00pm and Wednesday 10th at 11.20pm. It can also be seen on ABC NEWS channel on Saturday at 8.10pm AEST, ABC iview and at abc.net.au/4corners. 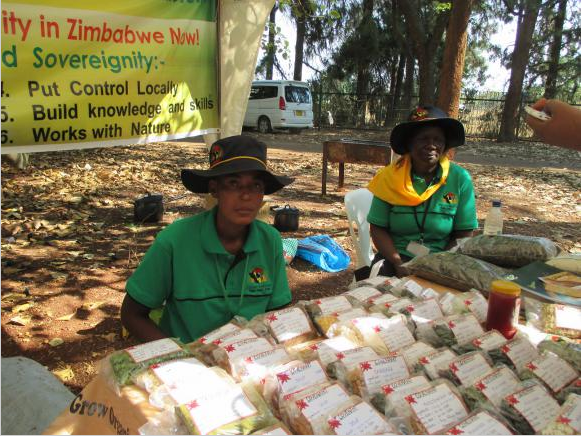 Above Photo: Women members of the Zimbabwe Organic Smallholder Farmers Forum, member organization of La Via Campesina, display their seeds at a seed fair. Photo Credit: Elizabeth Mpofu. Via Campesina formed [in 1993] when [a group of] peasants united to form a strong voice and strategize on the issues they were suffering from. Over time, Via Campesina became a global movement to advocate for policies which really meet the needs of the poor and marginalized, while fighting against those that do not. We develop global actions on agroecology, biodiversity, seeds, land and water territories, stopping transnational corporations, climate and environmental justice, trade, and peasant rights. Via Campesina members organize seed exchanges and fairs which allow farmers to learn how others are producing and mobilize them to join to movement. We also prioritize building relationships and working hands-on with [politicians]. We lobby governments to incorporate and protect our indigenous, local seeds as they develop policies, while [demanding] that GMO seeds are not promoted. Of course, this is a big challenge because the commercial industrial [seed] companies have a lot of money to give our governments. Harmonized seed laws [requiring seeds to be officially registered in order to be traded, and introducing intellectual property rights on seeds] pose another challenge across Africa. Regional bodies like the Southern African Development Community (SADC) and the Common Market for Eastern and Southern Africa (COMESA) are developing rules that will increase the availability of commercial seeds, only benefiting corporations like Syngenta and Monsanto. Indigenous seeds are not recognized. Meanwhile, peasant farmers are not provided with information [about the laws] and are not invited to participate in the policy formulation process. Because of this, we are forced to take action and put our concerns on the table. Zimbabwean farmers harvest in one of their gardens. Photo Credit: Elizabeth Mpofu. Many people and organizations beyond Via Campesina now support the Declaration of the Rights of Peasants and are campaigning for it to be accepted by the United Nations Human Rights Council [UNHCR] and Food and Agricultural Organization. Support for the peasant rights declaration has been growing in the UNHCR [since drafting the declaration began in 2012]. This comprehensive declaration includes issues from agricultural policies that recognize peasants: privatization of water, seeds, and energy, and respect for gender in agriculture. It has been a long journey but I think we are really going to win the acceptance of the declaration by the UN. From: Regeneration International, COOL THE PLANET. FEED THE WORLD. 1. In living soil lies the prosperity and security of civilization. In the destruction of soil is the destruction of civilization. Our future is inseparable from the future of the Earth. We commit ourselves to protect our soils and biodiversity. 2. Our seeds and biodiversity, our soils and water, our air, atmosphere and climate are a commons. The gifts of the earth vital to life have always been held in the commons with common duties to protect, and common rights to draw sustenance. Our seeds and biodiversity are a commons. Their enclosure through patenting is pushing diversity to extinction and farmers into a debt trap. Soil is the very basis of our life and our food. Water is a commons. It is not a commodity. It sustains our life. The air and atmosphere is a commons which give us clean air to breath and gives Gaia the capacity to regulate the climate. Polluting the air and atmosphere with greenhouse gases and emissions trading is a privatization of this commons. We do not accept the enclosure and privatization of our commons. We will defend and reclaim them through care, cooperation and solidarity. We commit ourselves to defending seed freedom as the freedom of diverse species to evolve, in integrity, self-organisation, and diversity, and the freedom of communities everywhere to reclaim open source seed as a commons. The saving and exchange of open pollinated, non-GMO, non-patented seed is an inalienable right. Farmers rights are non-negotiable. We will resist every law and technology that attempts to undermine the freedom of the seed, which is intimately linked to the freedom of Mother Earth so that the generations to come are as fortunate as we have been in receiving her gifts of diversity, nourishment and livelihoods. We join and stand together for our seeds and say no to GMOs, no to patents. Industrial Globalised agriculture contributes more than 40% of the greenhouse gases that are destabilizing the climate through deforestation, fossil fuel based fertilisers, packaging, processing , refrigeration, and long distance transport . Knowing that it is one of the causes of climate change, we do not accept Industrial Agriculture as a solution to the climate crisis and hunger. We do not recognize false solutions to climate change such as geo engineering, “climate smart” agriculture, genetic engineered “improved” seeds, or “sustainable intensification”. We commit ourselves to practice and protect small-scale ecological agriculture which produces more health and nutrition per acre and provides 70% of the food we eat, while it rejuvenates our soils, biodiversity and water systems, and stabilizes the climate. We will support and create local food systems which provide the answer to the food, nutrition and health crises, as well as to the climate crisis. Organic ecological small-scale agriculture and local food systems can feed the world while cooling the planet. “Freedom” has been hijacked through “free trade” which has substituted the freedom of people and freedom of life of the planet and its diverse species to freely evolve and nourish, with freedom of corporations to destroy the planet and the living economies which sustain the people. The ecological and social destabilization of the world in the last two decades is a result of the deregulation of commerce through the “free trade “agreements of the World Trade Organization (WTO), engineered and written by corporations, for the benefit of corporations. We commit ourselves to resisting the attempts to push new ‘free’ trade agreements such as TTIP, TPP and regional and bilateral trade agreements which are based on corporate rights and corporate personhood and which in fact dismantle human rights and our democracies and constitutions. We do not recognize corporations as persons. They are legal entities to whom society gives permission to exist within limits of social, ecological, and ethical responsibility; corporations having responsibility for climate change are subject to the Polluter Pays Principle. 7. Local living economies protect the earth, create meaningful work, and provide for our needs and wellbeing. Local living economies based on the law of return and regeneration of the natural world and society, nourish all life. Nature’s gifts and people cannot be reduced to ‘inputs ‘. Economies which focus on life and the wellbeing of people instead of corporate profits, rejuvenate and regenerate resources and work for all and for future generations. We will not participate in production and consumption systems, including industrial food and agriculture, that destroy the Earth’s ecological processes, her soils and biodiversity and displace and uproot millions from the land. In living economies there is no waste, and there are no wasted or disposable people. We commit ourselves to creating participatory, living democracies, and resist all attempts to hijack our democracies through powerful interests. We will organise on the principles of sharing, inclusion, diversity, and the duty to care for the planet and each other. We commit ourselves to breaking out of the vicious cycle of violence and degeneration, and creating virtuous cycles based on non-violence and regeneration for the wellbeing of all people and all species. We will not be divided by fear or hate, but will stay united as members of one Planet and one Humanity. And, in keeping with Gandhi’s principle, when rules and laws interfere in the higher laws that flow from the earth and our humanity, we will collectively draw the courage to not cooperate. 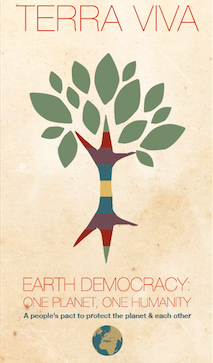 We will create an Earth Democracy in a vibrant and bountiful Earth – Terra Viva – which recognizes the intrinsic worth of all species and all people. Because all people and all species are by their very nature diverse, it recognizes diversity as not something to be tolerated, but something to be celebrated as the essential condition of our existence. And all life, including all human beings, have a natural right to share in nature’s wealth to ensure sustenance – soil, food, water, ecological space and evolutionary freedom. We make a pact to live consciously as Earth Citizens recognizing that the Earth Community in-cludes all species and all peoples in their rich and vibrant diversity. The rights of Mother Earth and human rights are not separate from each other and are one indivisible continuum. The violence to the earth and injustice to humanity are part of the same process. Sustainability cannot be separated from justice, human rights and peace. We will grow organic food on our farms, our gardens, our balconies, our terraces. We will plant Gardens of Hope everywhere as a concrete symbol of our pact with the earth for her re-juvenation. Through small steps with significant impact, undertaken by millions of people aware of their power by acting in resonance, harmony and unity, we will sow the seeds of change towards a new planetary citizenship, taking care of the Planet and each other by building living economies and living democracies. We start by planting a Garden of Hope today, 9 November 2015 in the Jardin Marcotte in Paris, together with the AMAP Ile de France Network and the Cultures en Herbes, as a first concrete step towards a new planetary citizenship. There Is Nothing Smart about "Climate Smart Agriculture"
Agribusiness corporations that promote synthetic fertilisers, industrial meat production and large-scale industrial agriculture are calling themselves Climate Smart. The Global Alliance for Climate Smart Agriculture was launched a year ago; Its membership of 21 nations includes only ten developing countries, three farmers´ organisations, and a large private sector (with numerous corporations), 60 % of which linked to the fertilizer industry. Monsanto, Walmart and McDonalds have launched their own climate-smart agriculture. CSA claims to include all models of agriculture. However it lacks any social or environmental safeguards and fails to prioritize farmers voices, knowledge and rights as the key to facing and mitigating climate challenges. Most of all, CSA actually threatens to undermine agro-ecological approaches generally recognized as the real solution to food production under climate change. However, despite these promising signals, we share deep concerns about the growing influence and agenda of so-called Climate-Smart Agriculture (CSA) and the Global Alliance for Climate-Smart Agriculture (GACSA). Climate change is the biggest and the most urgent threat our societies face. We need a radical transformation of our food systems away from an industrial model and its false solutions, and toward food sovereignty, local food systems, and integral agrarian reform in order to achieve the full realization of the human right to adequate food and nutrition. We therefore urge decision-makers at country and UN levels to reject the dangerous rhetoric of Climate-Smart Agriculture. Climate Smart Agriculture must not be confused with agroecology . Agroecology is a holistic approach to agriculture, based on principles of ecology as well as food and nutrition security, food sovereignty and food justice which seek to enhance agricultural systems by using and recycling natural resources instead of relying on externally-purchased inputs. It encourages local/national food production by small food producers and family farmers, and is based on techniques that are not delivered from the top-down, but developed from farmers traditional knowledge and practices as well as from farmer innovations. This approach is based on farmers participation and makes nature a powerful ally in ensuring food and nutrition security, building healthy soils and conserving water. It increases farmers incomes and resilience in the face of climate change, while improving biodiversity and crop diversity. It is therefore crucial for all efforts to realize the human right to adequate food and nutrition. Governments must recognise that industrial approaches that degrade soil health and water retention, pollute water systems, poison nature and create dependency on external inputs, impoverish biodiversity and ecosystems are not only harmful and unnecessary, but also deeply misguided for a planet facing hunger, ecological crises and climate change. Climate-Smart Agriculture may sound promising, but it is a politically-motivated term. The approach does not involve any criteria to define what can or cannot be called Climate Smart. Agribusiness corporations that promote synthetic fertilisers, industrial meat production and large-scale industrial agriculture  all of which are widely recognised as contributing to climate change and undermining the resilience of farming systems  can and do call themselves Climate Smart. CSA claims to include all models of agriculture. However it lacks any social or environmental safeguards and fails to prioritize farmers voices, knowledge and rights as key to facing and mitigating our climate challenges. It therefore actually threatens to undermine agroecological approaches as defined by practitioners , while endangering the future development and upscaling of such approaches. The Global Alliance for Climate Smart Agriculture was launched one year ago and is now putting a lot of energy into its outreach campaign, while its Action Groups have started working on their own objectives. As of 20th July, its membership of 21 nations comprised of only ten developing countries and three farmers´ organisations - in contrast with a wide corporate membership. While some organisations from civil society and rural social movements rejected the GACSA from the beginning, others have made repeated efforts to engage with it , to reduce the threat of green-washing and false solutions. In spite of these efforts, the concerns expressed were largely ignored, as recently recognised in a paper issued by the Institut du Développement Durable et des Relations Internationales (IDDRI). Instead, some of agricultures least environmentally sensitive actors were welcomed into the alliance: 60% of the private sector membership of the alliance is related to the fertilizer industry . In addition, transnational corporations that have questionable social and environmental impacts, such as Monsanto, Walmart and McDonalds have launched their own climate-smart agriculture programs . As the UN picks up the pace for action on climate towards COP21 and beyond, we call on countries to recognise that the Climate-Smart Agriculture path can take us in the wrong direction, falling short of ensuring food and nutrition security, and undermining the radical transformation of current food and agricultural systems that the world urgently needs. Without definitions, criteria, standards, safeguards or exclusions, Climate Smart Agriculture is a meaningless and dangerous concept that has no place as a climate strategy. Moreover, the GACSA is not accountable to any UN structure involved in food security, climate or agriculture. As the Green Climate Fund programme of work gets underway, we welcome the importance given to adaptation. Agriculture will be a principal component of this programme. However, we urge the GCF Board not to accredit any programme of work or institution that is based on Climate Smart Agriculture. Instead, we strongly encourage them to support community-based solutions emerging from frontline communities, such as agroecology. An Agenda of Solutions  is being created for COP21 which aims to demonstrate the commitment of non-state actors to reaching a new and ambitious legal agreement in 2015, and which could be included or referred to in the outcome document of COP 21 along with the negotiated agreement. We urge governments not to endorse Climate Smart Agriculture as a solution to climate change, nor to label any other initiative that would be part of the agenda of solutions as part of the concept. We face a critical moment. Real solutions to climate change must be agreed upon and urgently adopted. 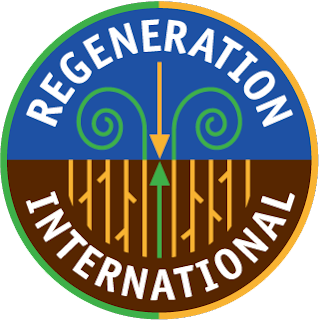 We urge decision-makers to stand against green-washed false solutions rebranded as CSA, and to have the courage to recognise and promote the decisive role of agroecology in ensuring food and nutrition security, the full realization of the human right to adequate food and nutrition, and food sovereignty in the face of climate change, resource scarcity, and growing demand challenges. The international and regional processes that emanated from the FAOs Symposium on Agroecology in September 2014 as well as the upcoming Committee on World Food Security High Level Panel of Experts report on Sustainable agricultural development and the recent Nyéléni Declaration of the International Forum for Agroecology, present a unique opportunity for agroecology to be endorsed as the mainstream pillar of agricultural policy frameworks worldwide. Moreover, communities, civil society organizations, organised social movements, peasants and faith-based organizations are developing, strengthening, and supporting alternatives at local and national level have proven to be successful in the global fight against climate change. We call on decision makers to acknowledge this broad range of tangible and concrete actions, to listen, support and accompany them, while not succumbing to global top-down initiatives that rely on models from the past. We therefore call upon decision makers to endorse the application of agroecology internationally within the UN processes relating to climate change and agriculture, as well as at national level.